I had heard about the struggle for civil rights in the 60s but it had never mattered to me. I had not realized that I could learn from the struggle, and that it could apply to the situation that I am in. 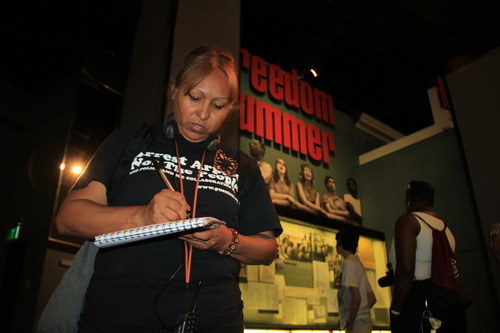 As an undocumented mother from Arizona, the more that I learn and think about organizing for my community, and what strategies we can use to fight for our rights, the more admiration that I have for the civil rights struggles of the African-American community in the United States, and the more that I want to learn from them. As we travel through the southern United States, especially through states that have such a rich history of racism against black communities, I have also realized that these are places also of resistance. Maricruz es madre y miembro de Puente en Arizona. Está una participante en la jornada por la justicia para levantar su voz, enseñar a todos los padres y todas las madres que hay que dejar a sus hijos como herencia que tienen que defender su respeto y dignidad. Maricruz is a mother and member of Puente in Arizona. She's on the No Papers No Fear ride for justice to raise her own voice and call to all parents to leave their children an inheritance of defending their respect and dignity. Tuesday July 31st of 2012 was our first day of activities in Denver Colorado, starting off early in the morning with a warm breakfast lovely made by some of the local members of the Unitarian Universalist Church, followed by a quick workshop presented by local community organizers, who explained the severity of a local anti-migrant law called SB 90, that has been around for about 6 years, this law works in the same fashion than section 2B of Arizona’s law SB 1070 which was approved by the supreme court. “I’m running this risk because I want us to be respected, I want us to be recognized as the human beings that we are,” Maria Cruz Ramirez said at the party, where she sat before a makeshift stage, surrounded by other bus riders.